Senators on Wednesday resolved to adjourn plenary in solidarity with the senator representing Kogi West, Dino Melaye, who is being held by the police in Abuja. 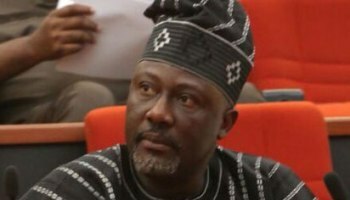 The upper chamber also resolved to invite the Inspector General of Police, Ibrahim Idris, to explain the circumstances that led to the arrest and detention of Melaye. Photographs of Melaye in handcuff on his hospital bed went viral on the internet on Wednesday. Senator Samuel Anyanwu (Imo East) drew the attention of his colleagues to the arrest, detention and hospitalization of Melaye allegedly on the orders of the police. He said: “When one of us has been belated, all of us have been belated. One of us is currently being treated like a common criminal. My heart is bleeding. I feel that we have all lost the essence of our being in the Senate and the essence of being called senators. “Yesterday (Tuesday), I in the company of two other senators went to see Senator Melaye at the National Hospital. Can you imagine Mr. President that we were not allowed to see our colleague. It was unbelievable and unimaginable to ever imagine that a day will come when senators will not be allowed to see their colleague who is in chains in the hospital. “Senator Peter Nwaoboshi is held by the Economic and Financial Crimes Commission (EFCC) and nobody is allowed to see him. The Senate should immediately take up the matter to ensure that Melaye does not continue to suffer this orchestrated dehumanizing and inhuman treatment. Can’t the Senate of the Federal Republic of Nigeria be respected?